Where else would “God” be found but in the service of Creation itself? The Earth is a living entity and an intricate, diverse web of all kinds of systems. As an invited guest, we are living and functioning within her ecosystem because she welcomes us and allows us to be here. We are made of her elements and we are occupants of her Body and Heart. She is, quite literally, the key to everything in our known universe. She is under our feet and in the air we breath. Our planet is our Mother, our home, and our Life-force. It doesn’t matter how skilled we are at meditation or connecting with Spirit because we always come home — right where you are right now. Through our relationships to the Earth, we find the spiritual and energetic connection that is available to all of us when we leave our hearts and minds open. That energy – the flow of life – is a continuous cycle of growth and decay, chaos and order, and an ever evolving ecosystem (including humanity) that reflects the nature of our ever-evolving Universe. But, in our illusory co-existence, we have come to put a “price tag” on Mother Earth and on ourselves by extension, all the while forgetting she is the divine giver of Life… and she can shake us off like a flea at any moment. Every intellectual, artist, spiritual leader and scientist will tell you that their inspiration comes from studying the delicate and intelligent design of natural Creation. Its intricate intelligence is an overwhelmingly profound but consistent and logical interpretation of “God” — the expression of a universal consciousness. By the expression of this live-giving consciousness, the Earth herself shows a Loving intention; through her thriving beauty and nurturing abundance. It’s an honestly wonderful and natural epiphany when we can finally come to terms with the fact that “God” has been right here all along, revealing intricate miracle after miracle, right before our eyes. The miracle of Life itself. Just as intricate, however, is an ancient web of lies that has kept humanity from truly living its divine truth. As a species, we should feel honored and humbled to participate in the interactive evolutionary experience that is Earth. But today, something has gone terribly awry. Would a sane species abuse their own habitat so recklessly? And would they allow such dangerous trends to intensify without taking any serious measures against them?.. The second factor is our “de-sacralised” vision of nature, our inability to sense the “being-ness” of natural phenomena. As children, we perceive the world around us with intense and vivid perception, and the natural world does appear alive to us, but as adults, our vision of the world becomes de-sensitised and automatic. We “switch off” to the vivid “is-ness” which we experience as children. The phenomenal world becomes a shadowy, one-dimensional place. Oh what a tangled web we weave! This sickness in our collective psyche – this beast of illusion/delusion – is something we have learned to deny to ourselves at all costs, to our own detriment. We have come to compartmentalize our own existence, believing ourselves to be separate somehow from Mother Earth and the Universe at large. The deceptions that lead us to this false sense of separation go to our very foundations, distorting our sense of self and all that is sacred. So, when we first begin to see though the illusion, the unbearable emotions of betrayal and fear many of us experience can feel like too hard a burden to bear. It can chill our bones and stoke our innermost fears. Heartbreaking. Painful. And usually very lonely. Sometimes the truth is hard and, more often than not, much stranger than fiction. Ultimately, however, the truth is unavoidable. It is also extremely empowering. By first understanding the nature of these deceptions and distortions, and the energy that brought us here, we can begin heal from them on a collective, vibrational level. Deception is not necessarily natural to our being rather it’s something we learn to live with at a young age. As a society, we have learned to adapt to a near impossible situation; a false dichotomy of separation, imposed and implanted by deceit. 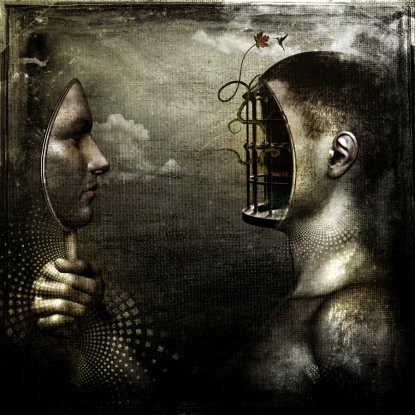 An unnatural consciousness has pervaded our collective mind, and its effects have permeate our shared existence in a multitude of ways; through paternalistic governments that presume to dictate our rights, not protect them; through divisive religions that teach separation from god, and from other faiths; through illusory media, which deliberately sells fiction as fact; through manipulated economies, founded on a presumption of inherent debt; through poisonous “health” practices; through the suppression of history; through spiritual misinformation; and through educating our kids in a way that steers, not expands, their natural way of thinking. All of these distortions serve to manipulate the collective conscious into submission perpetuating an imbalance that provides power and sustenance to those in energetic control. But today, we have reached a breaking point. The cycle of consensual abuse is breaking down. We are realizing en masse that we have lived out of balance for too long. We are questioning our existence at a fundamental level, and re-discovering the divine power we have in our lives; power that we have unknowingly given up for so long. And so, realizing we are a conscious part of the Earth’s eco-system and energy-system, we are being compelled to take responsibility for co-creating a more authentic future, restoring the balance and harmony to Earth – with and for one another. We can no longer stand quietly in a corner in fear of making the necessary and emotionally uncomfortable changes. If we don’t turn our fear into courage, our fears will either consume us or they will become manifest. It’s a beast of a journey, but there is a clear path just ahead. The collective identity crisis we are going through is an opportunity for humanity to find order in the chaos we have allowed to overtake our existence. It doesn’t matter if we call it archons, satan, or an opposing consciousness. It doesn’t matter whether you see its effect in government or religion, banks or media; it is all part of the same illusion. Unseen forces have deceived humanity into a state of confusion and disconnection, and we now have the opportunity to reclaim our spiritual center and create a culture that leads us home, not astray. There is nothing wrong or out of place with this kind of identity crisis, rather it’s a natural process of evolution as we adapt to seemingly overwhelming situations. But it is vital we realize these situations are the creation and perpetuation of a blatantly unnecessary struggle. We have spent eons chasing our collective tails and our “leaders” could end it all with the stroke of a pen. They know it and we know it. We have both the resources and the will to support peace, prosperity, health, respect, connection and co-operation, but our institutions have become twisted into machines of war, competition, imposed poverty, illness, and control. How? Because we tasked someone else to do it for us. We became comfortable separating ourselves from ourselves. As it turns out, we were our own worst enemy; our very nature carefully manipulated against us. There are many ways we can begin to find order in the chaos. Start by looking in the mirror. Ask questions of yourSelf, and open your perspective. Connect with the Earth. Our intuition is clearest within the realms of nature. Know your ‘enemies’, both seen and unseen. Know that only light can eliminate darkness. Transparency ensures Truth. Understand that, if it operates in secret you can be sure it is not operating in your favor. If in doubt, follow the ‘money trail’. It’s a sure way to know what path someone is truly walking. Most importantly, come to know your infinite power. Recognize where you give your power away, and where you can reclaim it. That’s where your new path becomes most clear. It is true, we have been moulded with deliberately altered perspectives and values into a society dependent on the undependable. But that doesn’t make us victims; Most of us have unknowingly enabled the power structure that has manipulated our collective consciousness, working for and even defending the status quo, following orders and “bringing home the bacon” in a sleepy state of unquestioning compliance. What it does make us is responsible for contributing to the solution, through conscious action. Simply speaking, we either consent to the deception, or we stand up together and change it, each contributing in whatever unique way the universe provides us individually. It’s not always easy to burden a deeper level of awareness but it’s no longer an excuse to “let someone else handle it” either. We have reached a choice point in our human history and we have to decide whether we’re going to stand tall in our humanness and, to find a strategy to turn this energy around, we have to truly understand our position and our part in getting here, and bravely be the change our most authentic self wants to see in the world. It can feel isolating and chaotic, but in the big picture, we’re right where we need to be on the path of our evolution. These are exciting times! We know what it’s like to destroy together, but do we truly know the power of what we can create together if we’re on the same page? Remember your light and your own power. Our potential is infinite. “God” is found in the service of Creation itself. She is in the air we breathe and the Earth beneath our feet, the fire that burns the cobwebs away and the spiritual river that cleanses our hearts; not a paternalistic figure in the sky but the divine Mother of Life from whom we are born and sustained, and to whom we finally return. We are a part of her and she is a inextricably part of us. The history we share with her is important. We must learn to recognize her (and ourselves) as the manifestation of divine intelligence, and honor her in our words and deeds. As we each adopt the common philosophy of “home is where the heart is”, we can begin to heal and re-build our planet and our societies in a grassroots way (literally), supporting and co-creating in our physical communities, online and otherwise. There is no way to truly live authentically from inside an illusion. As we move into our new awareness, our inner truth and our outer world can become increasingly incompatible. We find ourselves dissatisfied with small changes, feeling compelled to take the leap and re-shape our lives at a fundamental level. This takes trust. Just know that when we begin to walk a different path, new roads will always be waiting for us up ahead. The path of true enlightenment has no dead ends. So, if you’re in the process of questioning that toxic relationship in your life or the job that makes you feel less than honorable, stop and consider if this article is the ‘nudge’ you’ve been waiting for. At some point, we each have to begin to trust in the process of disconnecting from illusions of the world around us, and all its trappings, and let go of external factors and emotional attachments that speak of our consent and support of this distorted state of existence. It’s so important right now, as things are surfacing so quickly, to stay in our hearts. On this path of awakening, our “self-work” is never, ever done… because we are infinite and we never stop creating. Creation is, and always has been, all around us. We are a part of creation, and it is a part of us. Co-creating is our purpose for being here together. It is time we take our power back from alphabet agencies and secret agendas. Sharing our unique insights and gifts, we can shine light into the shadows and create a future of enlightenment, not illusion. Jennifer Deisher is the writer of the Moon Hippie Mystic blog and has been published on several Consciousness and Healing websites including Wake up World and OM Times Magazine. Thank you for stopping by Blueprints for Butterflies! This article © The Moon Hippie Mystic. Revised and edited for Wake Up World by Andy Whiteley. Dying to Live: Unity and Oneness, or Corporate Rule?